Propaganda is cheap to produce on the web. And a purposeful lie in an age of "viral content" not only can race around the world in a day but resurface time and time again with surprising resiliency. Such is the case with the myth of "Irish slaves," an ahistorical reimagining of real events weaponized by racists and conspiracy theorists before the Web and now reaching vast new audiences online. In short, the "Irish slaves" myth argues that the first slaves brought to the Americas were Irish, that they were white, and that this fact, covered up by liberal historians, undermines the legacy of the African slave trade and proves that modern theories of racial inferiority are true. Predictably, this revisionism has attracted Neo-Nazis, White Nationalists, Neo-Confederates, and even Holocaust deniers, while racist trolls have deployed the myth to attack the Black Lives Matter movement. More worrisome, though, is its widespread adoption by principally American Internet users as if it were a point of "Irish pride." Irish scholar Liam Hogan has been tracking and debunking this reincarnated meme since he first saw it in 2013. Last year, Hogan published an impressive five-part series exposing the myth and provided a detailed historical analysis of the origins and evolution of the meme. Hatewatch reached out to Hogan (who you should follow on Twitter) and asked him to share what he's learned in his work. What’s your academic background particularly as it applies to the study of systems of slavery? I’m a research librarian at the Limerick City Library and an independent scholar. I am particularly interested in the complex historical relationship between Ireland and the Transatlantic Slave Trade. While researching this, I noticed that there existed many common misconceptions about what is termed “Irish slavery,” which is applied in various ways to the Irish experience in the Anglo-Caribbean, Colonial America and the United States. I’ve since tried to contextualize this important part of Irish diasporic history for the general public while debunking some of the more egregious pieces of disinformation that are currently en vogue. I also track white nationalist groups and others who have purposefully spread “white slavery” or “Irish slavery” propaganda online since at least 1998. And let’s clear the air: Are you Irish? Yes. I’m from Youghalarra, which is a village near Lough Derg in Co. Tipperary. Briefly stated, what are the historical claims behind the “Irish slaves” meme? It broadly claims that indentured servitude and penal servitude can be equated with racialized perpetual hereditary chattel slavery. It proclaims that an “Irish Slave Trade” was initiated in 1612 and not abolished until 1839, and that this concurrent transatlantic slave trade of “white slaves” has been covered up by “liberal," “cultural Marxist” or “politically correct” historians. 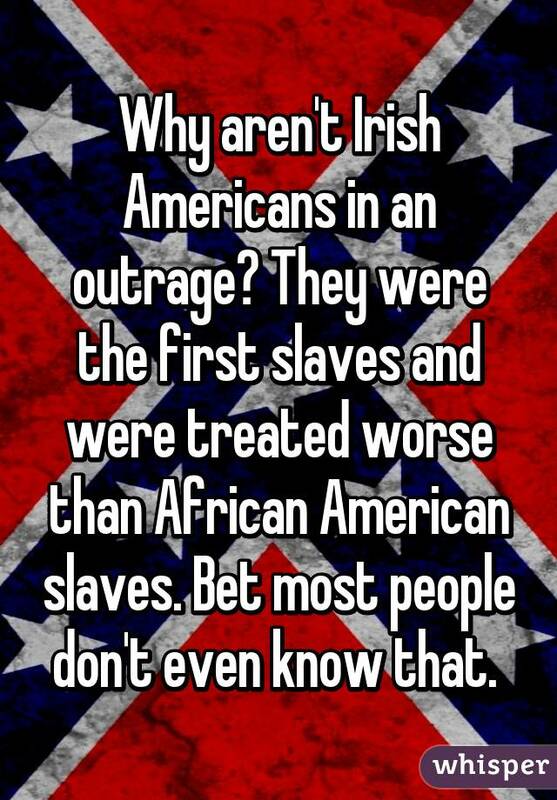 The various memes make many claims including (but not limited to) the following; that “Irish slaves” were treated far worse than black slaves; that there were more “Irish slaves” than black slaves; that “Irish slaves” were worth less than black slaves, that enslaved Irish women were forced to breed with enslaved African men, and that the Irish were slaves for much longer than black slaves. This is then invariably followed up by overtly racist statements, e.g. “yet, when is the last time you heard an Irishman bitching and moaning about how the world owes them a living?” The “Irish slaves” meme is a subset of the “white slavery” contemporary discourse which emphasizes class over race and is fueled by a potent cocktail of bad history, false equivalence, conspiracy theories, and reductionist fallacies. Your writing points to one of the earliest reported instances of the online meme appearing in December 2013, when a New Mexican Tea Party leader tweeted a version. When did you first encounter the meme online, and have you been able to isolate its earliest appearance on the social web? I first noticed the internet meme of “Irish slavery” in 2013 on Facebook when that Global Research article went viral. Irish politicians, celebrities, and the wider public began sharing it en masse from then on. After reading it, I immediately saw the problem, but I was unsure how to tackle it. So I continued my own research and the following summer I published an article on theJournal.ie (a popular Irish news site) about absentee slave-owners in Ireland who claimed compensation for their human stock in the British West Indies in 1834. I was surprised to find that the most popular below the line comment by far was an excerpt of the Global Research “Irish slaves” text. It was quite clear to me then that many would never engage with the history of the transatlantic slave trade when they had this false equivalence to fall back on. I think that’s what convinced me that I needed to put the record straight. Dr. Stephen Mullen has also challenged a similar phenomenon in Scotland where a “Scottish slaves” narrative is evoked to avoid confronting their considerable history of involvement in race-based plantation slavery in the ‘New World’. Michael Hoffman's website in 1999 via the Internet Archive. I’ve yet to isolate its earliest appearance on the social web, but it has been a common trope on Stormfront since at least 2003, especially in opposition to reparations for slavery. 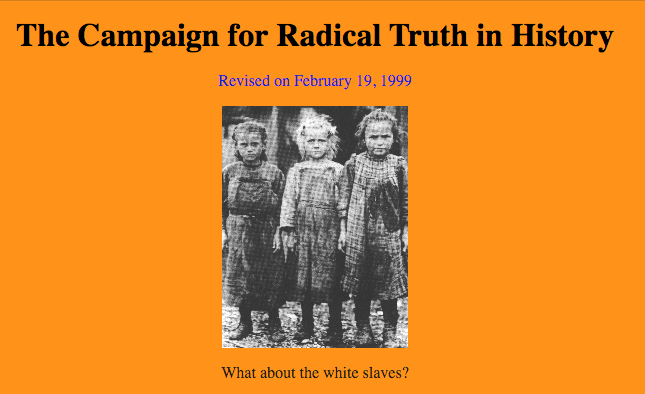 The earliest “white slavery” meme that I could find on the web appeared on Michael A. Hoffman’s website in 1999 when he captioned a photo of child laborers in the early 20th century with the line “what about the white slaves?” This same photograph is the centerpiece of a new iteration of the “Irish slaves” meme that appeared on Facebook in February 2016. You’ve described the most offensive facet of this meme being the appropriation of the Zong Massacre. Can you briefly summarize that for our readers? This specific aspect of the meme is disturbing. It appropriates the massacre of around 132 African victims of the genocidal transatlantic slave trade in order to diminish it. If you look at the Infowars version of the meme you’ll see it has even appended an extra zero, making the number of victims amount to 1302, while adding that “these slaves weren’t from Africa, these forgotten souls were from Ireland.” This shameless appropriation is then used by Infowars to mock calls for reparatory justice for slavery. I think that it is quite telling that so many people who propagate this disinformation did not recognize such a famous crime in the history of the transatlantic slave trade. It suggests that there exists a critical mass of ignorance that needs to be addressed. In too many cases this history is perceived as existing at a distance, in a peripheral if not marginalized space relative to the core nationalist narratives. How has the general meme spread? It seems to have something of a parasitic relationship to the rise of the Black Lives Matter movement. I first noticed it on Irish social media as part curiosity propagation and part free pass to dodge any discussion of Irish involvement in the slave trade. I then asked myself, if it found such utility here then what must be happening on social media in the U.S.? So I began to research this, and it soon became apparent that the “Irish were slaves too” retort had become one of the most popular obfuscation tactics on the social web. And it was spreading like wildfire. There was almost no situation where the meme was not used to derail discussions about the legacy of slavery or ongoing anti-black racism. Starting with Ferguson and with almost every subsequent police killing of an unarmed black person from late 2014 through 2015, the meme was used to mock and denigrate the Black Lives Matter movement. It is in a sense the “historical” version of the disingenuous All Lives Matter response to demands for justice and truth telling. I have seen it used to derail conversations about Sandra Bland, the McKinney pool party incident, the Spring Valley High incident and so on. I have collected hundreds of examples of it on Twitter (here) but it is a more common on Facebook where it continues to incubate. Some of these racist memes on Facebook have garnered over 200,000 shares so far and one in particular was shared nearly 100,000 times in just over a week. Notably the Neo-Confederate community are another cohort who embrace the meme. In the wake of Dylann Roof’s white supremacist terrorism in Charleston, and the debate about the Confederate flag, it surfaced in some unexpected places. In June 2015 a Confederate flag storeowner in Virginia referred to "hundreds of thousands of white slaves from Ireland". This year I’ve tracked the meme being shared by the Texas League of the South, History of the True South, Love My Confederate Ancestors and the Sons of Confederate Veterans. They seem to believe that this meme somehow negates the fact that the Confederacy fought a war to perpetually enslave millions of African-Americans and their descendants. Is the meme most popular in Ireland/UK, or just the United States? 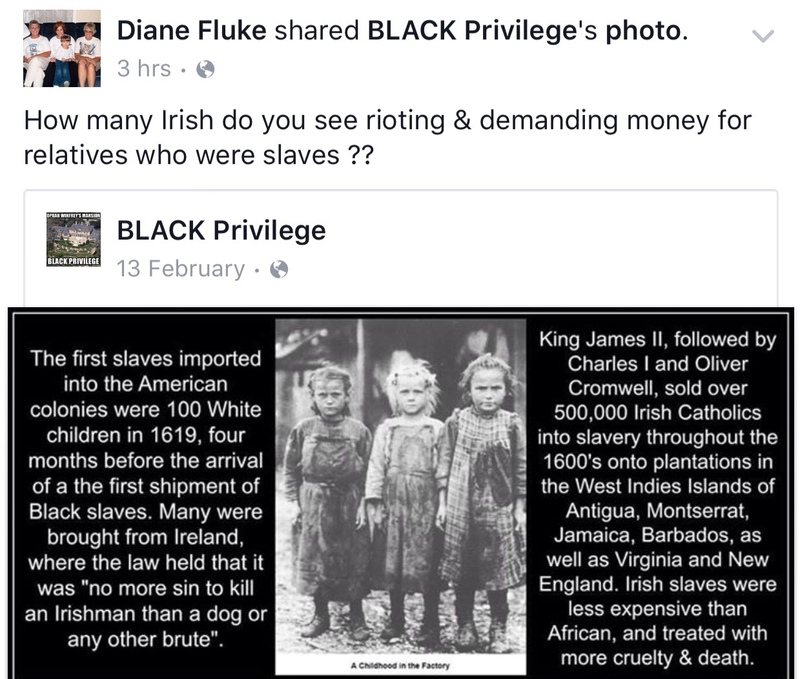 Almost all of the popular “Irish slaves” articles are promoted by websites or Facebook groups based in the U.S. So it’s predominantly a social media phenomenon of white America. This is even more pronounced when tracking the memes. I took a less than 0.1% random sample of that extremely popular single instance of the meme that was shared on Facebook in February 2016. I geotagged the location data of this sample and the result illustrates that while this is definitely a U.S. trend, it is also present internationally in line with white nationalist sentiment. This concurs with my research as I’ve tracked its promotion both by individuals and white nationalist groups in South Africa, Australia, Ireland, UK, Canada and Zimbabwe. Talk about this revisionist history outside of the online meme. You refer to books like “To Hell or Barbados” (2000) and “White Cargo” (2007) as “pseudo-history.” Is it fair to call this a “revisionist project”? If so, what are its origins? It’s complex as there are multiple layers to this. The most crude are the various racist visual internet memes in circulation. Next you have a wide range of ahistorical “Irish slaves” blogs and articles that are promoted by high traffic sites like Daily Kos. I believe the fact that major media outlets have endorsed this narrative is an important factor in explaining why this mythology has gone mainstream. People trust these sources and assume that editors have verified the claims made and are authentic. Rather than being informative they are merely elongated memes built exclusively on disinformation and distortion. Thousands of well meaning people have been duped in this way. 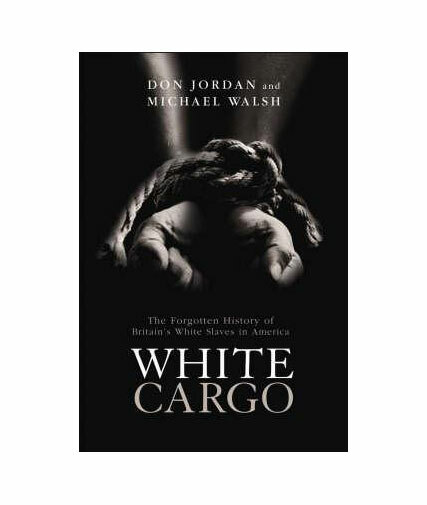 While misrepresenting the author’s work, the cover image of “White Cargo” is used as a source for "Irish slaves" and "white slaves" propaganda. It’s alleged that supporting these articles are a range of oft-referenced works of popular history authored exclusively by non-historians e.g. O’Callaghan’s “To Hell or Barbados” (Brandon Books, 2001) or Jordan and Walsh’s “White Cargo” (NYU Press, 2007). While there are problems with both of these books, particularly the former, which seeded the “forced breeding” part of the mythology, most of the “Irish slaves” articles do not quote from them. By using the cover image of “White Cargo” they misrepresent the author’s work as being the source for their propaganda when generally it is not. Nonetheless the sensationalist cover and subtitle of this book has itself become an internet meme used to equate racialized perpetual hereditary chattel slavery and indentured servitude. These articles instead rely heavily on an unreferenced blog about “Irish slaves in the Caribbean” that appeared on the Kavanagh Family website in 2003. More pertinent is the work of Michael A. Hoffman II, a Holocaust denier and conspiracy theorist who self-published “They Were White and They Were Slaves” in the early 1990s. It is by far the most influential book on so-called “white slavery” in white supremacist circles and it appears to be the origin of this revisionist project. For instance, when researching this, I found a PDF copy of this book hosted on the Racial Volunteer Force (a Combat 18 splinter group) website. When I returned to this site some months later it had been shut down. So I searched again and found another PDF of the book on Tom Metzger’s White Aryan Resistance (WAR) website. It is not difficult to understand why white nationalists and fascists love this book. 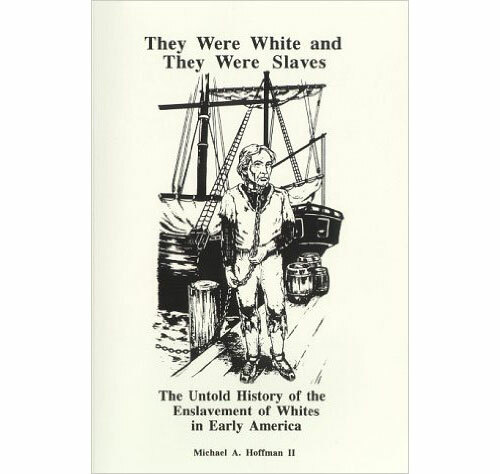 It argues that all European indentured servants, child laborers, convicts, free laborers, impressed sailors, the poor and the general working class population were unequivocally “white slaves.” That “white guilt” is an invention of the elite and that poor white Americans also deserve reparations because their ancestors also endured “slavery.” Chapter titles include “White Slaves Treated Worse than Blacks” and “White Losses in the Middle Passage Higher than that of Blacks.” The book includes testimonials from Revile P. Oliver, Wilmot Robertson and James J. Martin and an excerpt (“The Truth about Slavery”) has featured on the website of the Occidental Pan-Aryan Crusader since 1998. This group was a member of William Pierce’s National Alliance. Self-published in the early 90s, “They Were White and They Were Slaves” was written by Holocaust denier and conspiracy theorist Michael A. Hoffman II. The book is one of the earlier examples of "Irish slaves" propaganda. Hoffman, true to form, blames the “cover up” of “the true history of white slavery” on the “approved house scholars.” Unfortunately for his conspiracy theory Hoffman makes this claim in a book that is built on selective quotations taken from nearly 200 different secondary sources. Quite the cover up. This book’s sole purpose is to obscure the profound differences between white servitude and black slavery in terms of scale, duration, type and legacy in an effort to deny reparations for slavery in America. It is instructive to note that this is not a new development. The exact same tactics were used by contemporaries to justify the transatlantic slave trade and to defend the institution of racialized perpetual hereditary chattel slavery in the Antebellum South and the Anglo-Caribbean. So this whataboutery as denialism has a pro-slavery ideological lineage and to see it flood the social web in 2016 is just remarkable. What has been the reception to your work? From other historians? From “Irish slaves” adherents? You mentioned you are likely to expand your research into a book. What else do you hope to explore on this topic? I would like to reclaim the history of Irish servitude in the 17th century Anglo-Caribbean and present it in context for a general audience. The Cromwellian policy of forced transportation to the colonies in the 1650s (which included an estimated 10,000 Irish people) understandably scars our collective memory and it deserves both respect and close attention from anyone interested in the history of the unfree labour systems in the Atlantic world. Prior to the sugar revolution and the massive investment by Europeans in enslaving and dehumanizing African people, the living and working conditions of servants and slaves were similar. As the British colonies transitioned to large-scale sugar plantations both groups were exploited for profit, indentured servants for decades and enslaved Africans for centuries. I also hope to explore why the meme appeals to racists. Why is it used so often to justify anti-black nativism and racism? The sentiment is we were slaves, too, but we moved on, and it speaks to the racist essence of white nationalism. This notion of racial assimilability can be traced back to Wilmot Robertson’s The Dispossessed Majority and if you go back further you’ll see that its main origin is the fascist ideologies of the 1930s, especially Benito Mussolini’s Italian Fascist Party. Their “Manifesto of Race” was published in 1938 and is a white nationalist playbook. 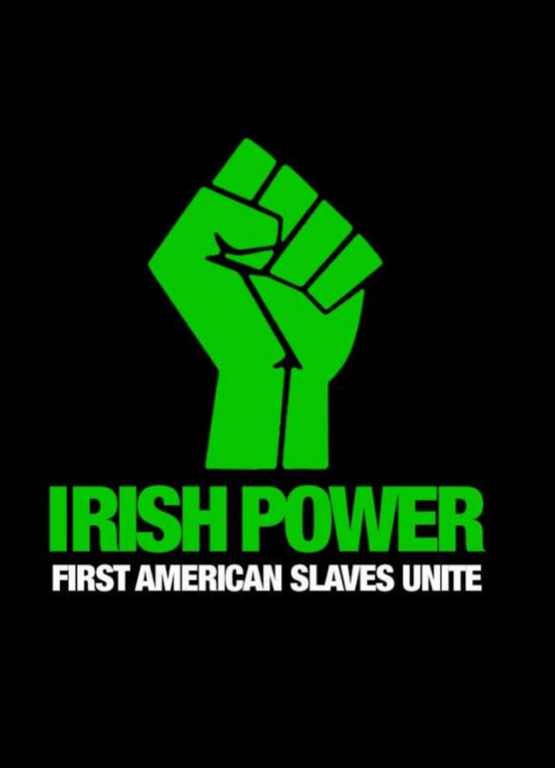 Likewise these “Irish slaves” and “white slaves” memes project a pseudo-mythological narrative to provide (a)historical justification for racial prejudice. This explains why the memefication of “white slavery” is catnip for racists.